If I were to ask you to name a famous feminist, who would you say? I’m going to go out on a limb and guess that most of you would probably say Gloria Steinem. And with good reason. A pioneering feminist icon, she’s been the face of feminism for nearly 50 years. Many people have admired and judged her, putting their own perceptions on who she is. In the documentary Gloria: In Her Own Words, Steinem tells her own story. Directed by Peter Kunhardt and produced by Kunhardt and Sheila Nevins, the HBO documentary which also aired at this year’s Athena Film Fest, “recounts her transformation from reporter to feminist icon.” It explores Steinem’s life through intimate interviews and impressive historical footage, focusing on the tumultuous 60s and 70s, the core of the Women’s Liberation Movement. It’s an intriguing and thought-provoking introduction to feminism and insight of a feminist activist. “Women were standing up and sharing their abortion experiences…I listened to these women testify about all that they had to go through, the injury, the danger, the infection, the sexual humiliation, you know to get an illegal abortion. And I suddenly realized why is it a secret, you know? If 1 in 3 women has needed an abortion in her lifetime in this country, why is it a secret and why is it criminal and why is it dangerous? It’s interesting that abortion can be a catalyzing force in declaring a feminist identity. But it makes sense. When the government tries to take away your reproductive rights, to make choices about your own body, you realize the importance your voice and standing up for your rights. And Steinem’s absolutely right; an abortion stigma of shame should not exist. There’s nothing shameful in making a choice about your reproductive health. With the passage of Roe v. Wade and the legalization of abortion in 1973, “reproductive freedom” was established “as a basic right like freedom of speech or freedom of assembly.” Sadly, it’s a war we’re still fighting to win. 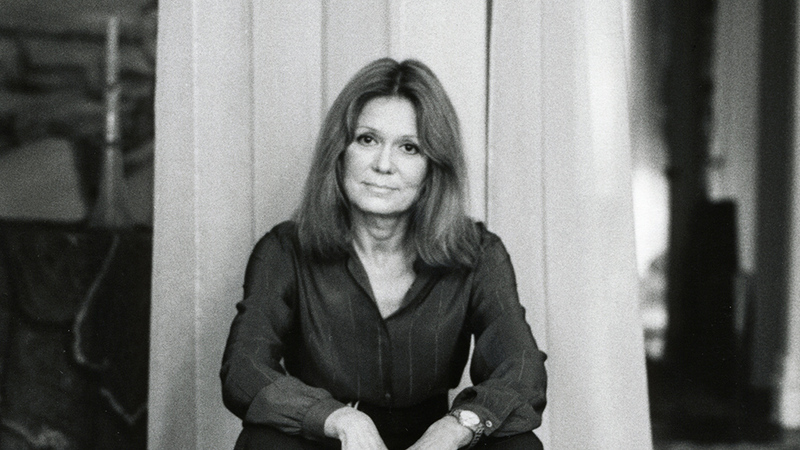 As she “realized there was nothing for women to read that was controlled by women,” Steinem recognized the crucial need for feminist media. This sparked the creation of Ms. Magazine, the first feminist publication in 1972, which Steinem co-founded and edited. She said that while they didn’t invent the term “Ms,” it was “the exact parallel to “Mr.” and it had a great, obvious political use.” Marital status doesn’t affect male identity, so why should it affect women’s? Men in the media predicted its rapid demise. Yet it sold out in a week. Thankfully, it’s still in print as it’s one of my fave magazines! Steinem frankly shares her triumphs and her pain. She discussed her friction with feminist Betty Friedan, her admiration for her friend U.S. Representative Bella Abzug, a feminist pioneer, and her alliance with activist Angela Davis. She talks about her regret at distancing herself from her mother and her choice not to have children saying “having children should not be such a deep part of a woman’s identity.” She discussed her marriage to husband David Bale, whom she called “an irresistible force” and who sometimes introduced himself as Mr. Steinem, much to her chagrin. She survived breast cancer, depression and faced her own lack of self-esteem. While the documentary alludes to Steinem’s other social justice passions, one for me, is glaringly omitted: her passion for animal rights. As a feminist vegan, I often see the two movements bifurcated, despite some of the parallel struggles. So it would have been great to see that here. I love this holistic view of abolishing kyriarchy and multiple systems of oppression. Feminist writer Amanda Marcotte critiqued the documentary as “fun” and “worthy” yet “incomplete” and “far too upbeat.” I see her point. Yes, some events, particularly the ERA, were glossed over and some viewers might not understand the full scope of the struggles and sacrifices made during the women’s rights movement. But I’m glad it’s hopeful. This is a documentary about Gloria Steinem, her views and her experiences; not a documentary on the history of feminism. Sheila Nevis, the president of HBO’s documentary film division, views Gloria: In Her Own Words not as a biography but rather “an inspirational film” for young people “who didn’t know who she was.” For seasoned feminists who feel distraught over the plethora of incessant struggles, it’s nice to be buoyed by optimism. And for those who don’t call themselves feminists or don’t know much about the women’s movement, this might pique their curiosity to explore feminism. Inspiration is a powerful and sometimes underrated thing. When someone leads a life in the spotlight, many myths and misconceptions may swirl around their public persona. But Steinem lays out her life: her triumphs, accomplishments, woes and heartbreak. It’s time you got to know the person you might think you knew, the woman who helped catalyze the feminist movement in the U.S. I didn’t think it was possible to be even more inspired by Steinem than I already was…but I am. Tags: abortion, activism, Athena Film Festival, documentary, equal pay, feminism, feminist, Feminist Icons, Feminist movement, Gloria In Her Own Words, Gloria Steinem, HBO, media, reproductive rights, sexual harassment, Women in Documentary, women's movement. Bookmark the permalink.